Notify, collect, remind, negotiate, contact and send messages with Go4Clients Collection Campaigns! A collections department needs to contact a large database of debtors quickly and effectively. Getting the debtor to pay their account is the goal of every communication sent. 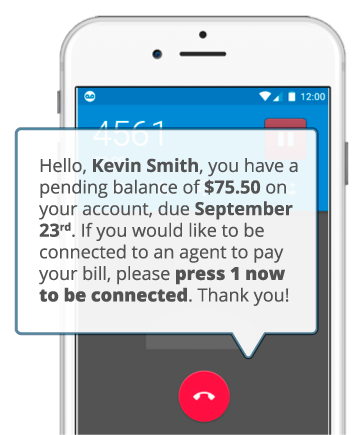 Go4Clients can personalize every phone call and text message sent automatically with any user’s name and account information. This results in MORE user engagement and MORE calls successfully transferred to agents. With the Go4Clients platform, you can use a Virtual Agent to create and send thousands of calls, so you can focus your agents on receiving those transferred calls. No new agents and no new infrastructure needed! All you have to do is press START on your Go4Clients collections campaign!